LUMS Center for Entrepreneurship, recently inaugurated by Pakistan’s leading businessmen, including Syed Babar Ali and Mr. Abdul Razzak Dawood, has already inducted its first batch of startups into The Foundation business incubator. LUMS, the nation’s most prestigious higher education institution, built the Center for Entrepreneurship with the vision to make it the largest breeding ground for sustainable, high-growth and high-impact businesses in Pakistan. The management of the center, headed by Mr. Khurram Zafar, an entrepreneur himself, as well as an independent council of leading entrepreneurs of the country scout for promising upstart businesses all over Pakistan and inducts the most promising ones into this four month program. The Foundation offers co-working space, utilities, internet, and other administrative support to the startups as well as access to a network of world-class mentors, business leaders and investors who guide and groom these young, passionate entrepreneurs. The center is also collaborating with investors to put together a seed stage investment fund for the startups as well as collaborate with business center developers to offer subsidized office space to the graduates of the Foundation program. The teams that have been inducted as the first batch of The Foundation includes, Cognitica which develops augmented reality based mobile and marketing solutions. Beed, based on research done at LUMS, this team is working on making all broadcast content interactive with the aid of smart phones. Savaree, this company is building a trust-based, ride share social network that allows drivers to monetize the free passenger seats in their cars by posting routes and connecting with riders that share that route. Bugdev Studios, a team of very passionate mobile game developers and designers that build and publish creative, fun, action-packed games that make people think, feel and enjoy. Other start-ups include BizClout, a one-stop solution to fully e-commerce enable SMEs with-in 15 minutes using a proprietary content management and ecommerce platform. The company offers value-added products to promote and market these online brands as well. MARO, oven baked bread (tandoori Roti and Naan) is one of the most commonly consumed food item in Pakistan and MARO aims to setup a network of ‘Tandoors’ that provide healthy bread and an immaculate consumer experience at the same price as traditional ‘Tandoors’. Appography, the company aims to improve the customer experience by introducing a visual navigation IVR (Interactive Voice Response), in a clutter-free, simplified and more consumable manner on customer smart phones. The Foundation is one of the many innovative projects under the LCE banner with other centers in progress such as the Skills Commercialization Centre and a Corporate Innovation Center amongst others. Last Sunday, as most of LUMS either enjoyed its day off or spent the morning – and half the day – catching up on some much-needed sleep, SSE brimmed with activity from early in the morning to well after sundown. The wheat-and-rust facade of the Syed Babar Ali School of Sciences and Engineering, or SSE as it is commonly called, is the first building that swings into view as you pull up to the university’s iron gates. A towering structure, it stands serenely against the azure morning sky. The calm in the early morning breeze did not carry itself inside the building though; in a few minutes, the much awaited Google DevFest Lahore Conference would soon begin, and there was much to look forward to in the rest of the day. Past the pane-less glass entrance to the School, Luminites sporting lanyards around their necks and wearing the stylized chevron symbol T-shirts hurried about, registering attendees and guiding them about the building. Since it was nine in the morning, a cosy tea room had been set up in the Computer Science department to give the guests a few crucial minutes to drink up and anchor their eyelids safely to the top of their sockets. Once the conference began, however, we soon realized that this was not needed at all. Room 301, where the action was to go down, looked, to put it simply, very Google-y. And by that, I mean absolutely gorgeous. The carpeted, stepped classroom was decorated in Google’s signature colours; LED strips lined the matrix of six sliding chalkboards (on which were pinned the aforementioned T-shirts); balloons had been moored to the panes of the windows on either side of the room; bright ribbons had been painstakingly tied around each seat’s backrest; spotlights washed the rear wall with multi-coloured light; and around the room were plastered logos of the search engine giant’s many products and services. Soon after we settled into our seats, the microphone crackled to life and, after an intro to the event, its proceedings, and its rules & regulations, the different sessions planned throughout the day kicked off in order. 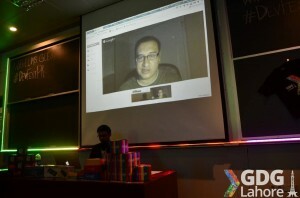 Sarmad Gilani and Madiha Chan, two Googlers joined us all the way from Mountain View for a Hangout in separate sessions to discuss Google’s powerful yet highly flexible App Engine and creating Android apps, respectively. Sarmad, after announcing how dearly he misses Pakistani food, went on to educate the audience on the many aspects of App Engine, detailing its enticing features and giving examples of famous products that utilize the service. Madiha talked about the basics of Android app development and, following some confusion with the slideshow, effortlessly adlibbed on and taught the audience all they needed to know to kick-start their Android development endeavours. To teach us some more about Android and its highly customizable nature, Faryaab Sheikh, a young Android pro, ran a quick video tutorial of his own making on creating Custom ROMs for the OS. Currently an O Level student, Faryaab has been tinkering with Android devices for over three years now and is a recognized developer and contributor at XDA Developers, one of the world’s largest mobile software development communities. With numerous successful Custom ROMs to his name and hundreds of thousands of downloads under his belt, Faryaab is the perfect example of how you don’t need to wait for college and Computer Science courses to start working on Android devices. Another whiz-kid, Salman Hijazi, an energetic and articulate freelancer from Islamabad, shed light on the underrated profession of freelancing and its increasing relevance in creative fields. A Computer Science junior at FAST-NU, Salman first stepped into the world of online freelancing over five years ago and has since racked up a stellar record on many websites, most recently on Elance – his preferred choice, of which he is the official representative in Pakistan. His secret: an ability to write catchy project proposals. The half before lunch break ended on a sombre albeit intriguing note: hacking and mobile security. 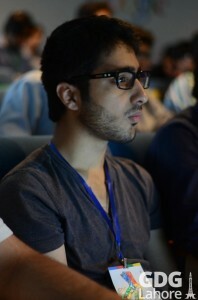 Battling a sore throat and the visibly decreased attention spans of the audience, Hassun Mujeeb, a network security expert, after receiving an unexpected round of applause upon revealing his profession as a hacker, explained how hackers break into apps and where the Cloud – a popular model for mobile systems – comes into all of this. A white hat with a wiry build and ponytail, he clearly looked the part, and answered some participants’ queries about protecting their online presence with a few simple measures, the best being a swift removal of any plugins/widgets/addons that are not absolutely essential. With strong winds whipping our tags around, we made our way towards LUMS’ Pepsi Dining Centre, while the overcast sky above showed clear signs of an impending downpour. And sure enough, after lunch (which was a splendid affair in itself), the sky was pouring hard, drenching the entire campus and leaving it looking even more beautiful than before. A short dash back to SSE, skipping across puddles with our heads held down, and we were brushing off water droplets and settling down for the second half of the conference to commence. Goodie time. It was that time of the day when a few lucky chaps from the crowd got to claim some of the mysterious colourful boxes stacked on the table since morning. 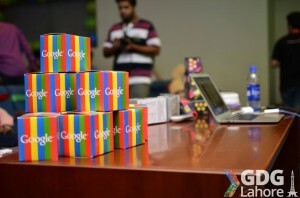 Correct answers to questions, both trivial and not-so-trivial, were rewarded with Google goodies. Even those who couldn’t manage to raise their hands in time for Q&A had their chance at winning one. The catch: they had to be the youngest in the room, or the oldest, or the owner of the worst phone. Despite disassembling my phone to qualify for the last of the three, I was told that my humble Nokia needed to be even more bashed up to warrant a prize. The fun activity played its part in picking up the energy level in the room, and soon the conference got back to business. In a room filled with code-wielding developers, usability of a product is barely talked of. Ahmed Shuja, himself a pre-Y2K era COBOL developer, was there to set the balance straight. Dismayed by how inconvenient programs were to use, Ahmed switched over to the user experience side of things, and has founded his very own design firm in the process. After clarifying the much argued upon difference between UI and UX, he schooled the audience on good design practices and answered some questions that trouble designers in the industry. His golden piece of advice: follow the conventional design guidelines for the OS you’re targeting and keep it simple. 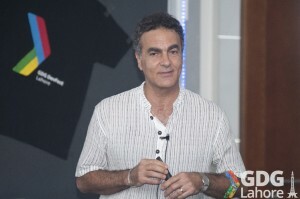 Nelson Mattos, Vice President of Engineering – EMEA Region of Google, was the chief guest of the event. Having touched down in Pakistan only a few hours before, this was his first time in the country and he was as thrilled to be among us as we were to host him. 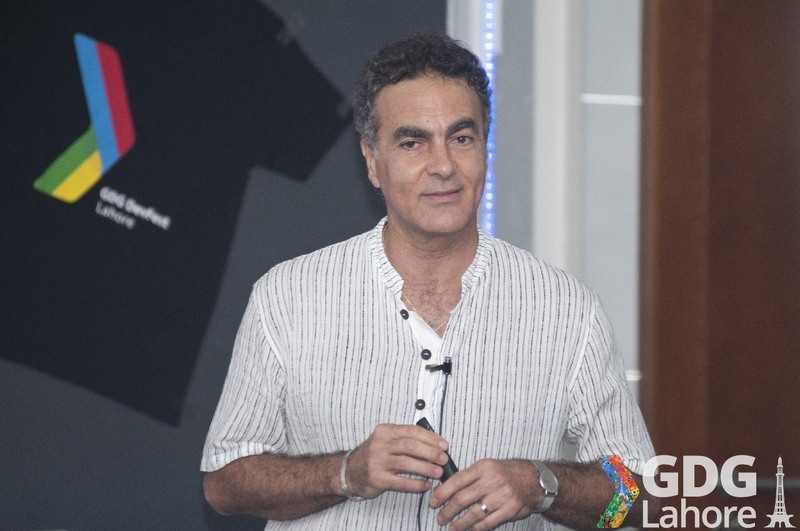 He briefed the audience on Google’s many programs being carried out in developing markets, which included Google Student Ambassadors and Google Developer Groups. 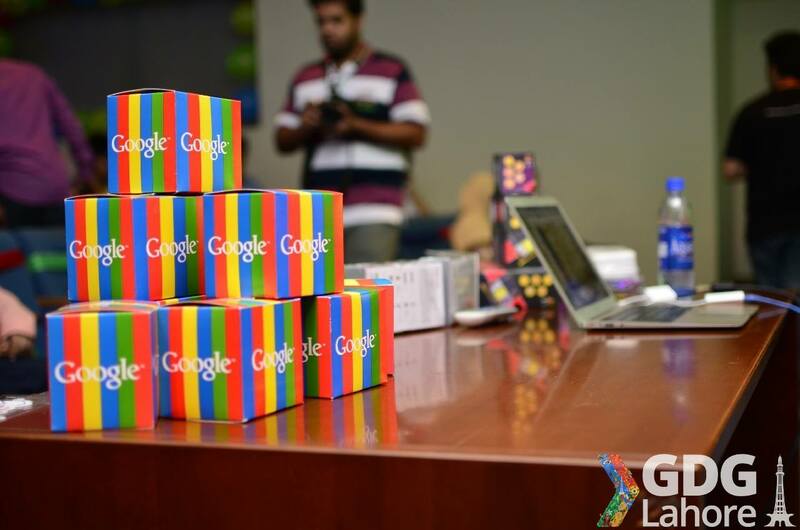 Pakistan is home to some of the most active chapters of these, he said, and Google looks forward to more partnerships in the country. Even Pakistanis not directly affiliated with such programs had contributed much in the online space in the form of edits on Google Maps, leading to some local cities like Faisalabad being mapped in even more detail than most American ones. The highlight of his talk was the Google’s Innovation Punjab promo, a video that featured Pakistan’s national anthem as background music. Barely a minute into it, the entire audience rose from their seats in a surge of patriotism, right on cue with the electric guitar solo that resonated throughout the hall. The room may have been decorated in many colours, but at that moment, it bled green to the core. After a quick prize distribution ceremony of the previous day’s programming competition and group photographs of the winners and the speakers, the conference got on to its final leg: entrepreneurship. DevFest organizers had clearly saved the best for last. The first of the three sessions centred on entrepreneurship was a panel discussion with Pakistani entrepreneurs. Nabeel A. Qadeer (Program Manager, Plan9), moderated the discussion between local industry gurus Zafar Khan (CEO, Sofizar), Zia Imran (CEO, VahZay), Sajjad Kirmani (CEO, Infogistic), and Amer Sarfraz (CEO, Olaraound). With scores of years of combined experience in the IT industry amongst themselves, the panelists did not need the aid of any microphones to get the audience’s attention, choosing to speak freely instead. The attendees, almost all of whom were developers themselves, could be felt leaning forward in their seats as Nabeel asked each of the panelists some common questions regarding the IT sector that plague the minds of graduates and students alike. After all, this was everyone’s best shot at getting a glimpse into the minds of those who know how the industry works, and who work it themselves as well. 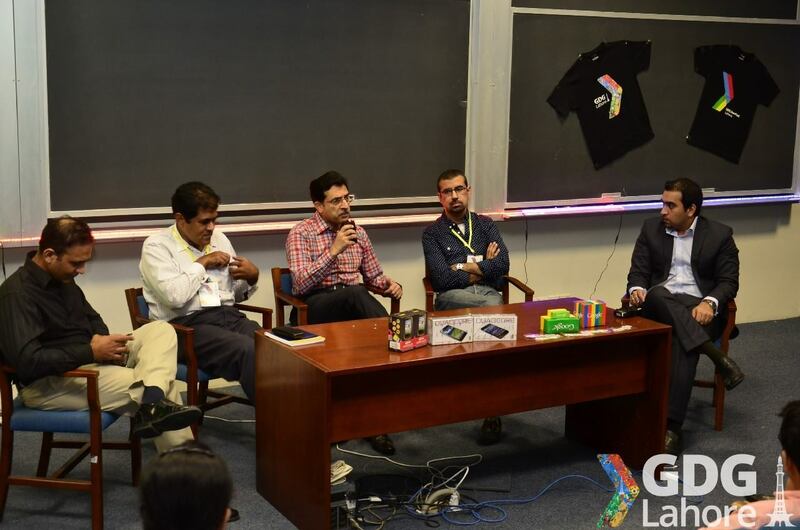 The panel even debunked some common myths associated with Pakistan’s IT industry. After a few rounds, Nabeel opened up the floor to questions from the audience, and the room was instantly a complete show of hands. 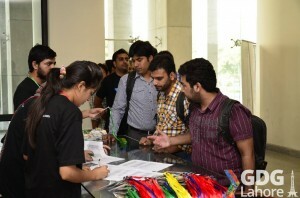 While some inquired about entrepreneurship, others inquired about trends in the job market. While other panelists spoke plainly, Zia Imran’s brutally clear-cut answers to the questions sent waves of laughter and applause through the room. Much to the audience’s dismay, all pending questions had to be cancelled and the panel discussion cut short as DevFest had a schedule to maintain. And so it was on to the next session: an intro to Plan9 by Nabeel A. Qadeer – its manager. Although quite a few people in the audience had already heard of Plan9, the majority did not know about incubators and how immensely useful they can be for a struggling entrepreneur in search of his big break. Nabeel introduced Plan9 by starting off with the very basic needs of an entrepreneur: workspace, mentorship, legal advice, investment opportunities, and even electricity, to name a few. These are hard enough to come by in real life, let alone getting them for free. But Plan9 does just that and even gives its incubatees a monthly stipend to help them along. It sounds too good to be true, but there’s a reason all this is possible: the Punjab Information Technology Board. It is only because of it being a government project that Plan9 is able to offer all this and more to entrepreneurs. With all the hardwork that has gone into bringing the incubator so far in its very first year of operation, the international technology industry has started to take interest in it, too. Plan9 now brings together mentors and investors from other countries as well as from Pakistan itself to help its incubatees make the most out of their startups. By this time, everyone in the room was thinking the same things: so how do we get into Plan9? The answer: a series of exhaustive Launchpads held in Lahore, Karachi and Islamabad from where the top teams are awarded incubation at Plan9. As Nabeel ended his talk, someone from the audience asked if Plan9 took any equity in their incubatees’ startups – a perfectly valid question, since that is the model upon which most incubators function. The answer was simple: Plan9 asks for nothing in return – no equity, no nothing. If the room had not already been sold on Plan9, this answer made sure that it had. 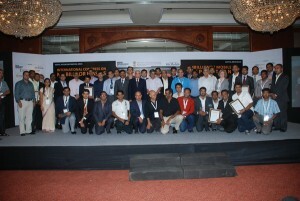 The last session of the conference would be a story – a success story. After all, what entrepreneurship talk is complete without a good ol’ narration of how someone made it big? 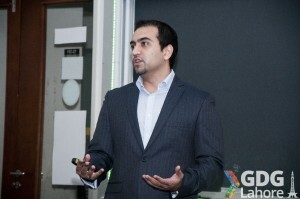 And so it was to be LUMS’ very own Ali Rehan who would tell his tale of starting up. His startup Eyedeus and its inaugural product Groopic have been making all the right headlines in the media, both abroad and at home, but few know how it all came about. Ali chose to tell his story through the unparalleled awesomeness of stick figures. His journey started off when he quit a stable job at Telenor and returned to SSE’s Computer Vision lab. 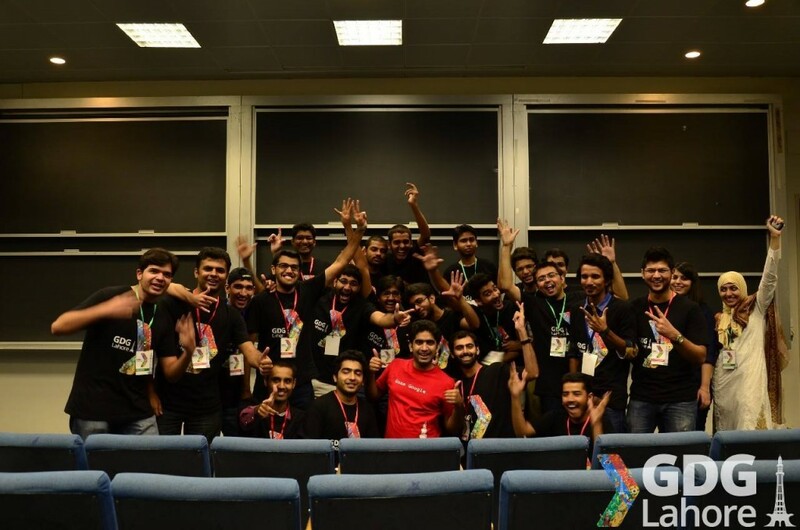 No strangers to using Computer Science to have fun with photographs, Ali and his mates entered their group photography app – then simply called ‘Group Photo’ – into Startup Weekend Lahore last year. Winning the competition instilled a fresh spirit in them, so, they applied to Plan9 for incubation – and got accepted. Six months later, they emerged from the program with a brushed-up product, revamped business plan, and loads of new industry connections. After the incubation cycle had ended, Plan9 funded their trip to Startup Asia 2013 in Singapore, where they got even more exposure than before. They finally hit it big when Eyedeus Labs got selected to the highly exclusive BlackBox Connect in Silicon Valley, where they were one of only eight startups from across the world. Ali and his teammates managed to make the best of an initial inferiority complex and ended up winning an extended acceleration program. While all this was happening, Groopic got featured on top notch technology blogs like TechCrunch, CNET, Gizmodo, and Cult of Mac, to name a few. Looking back at it all, Ali believes that the only way you can trace a meaningful path through all of Groopic’s achievements is, well, by looking back at them. “You can only connect the dots looking backwards,” he quotes Steve Jobs. The best he could’ve done at the start of it was to trust his instinct, and that’s pretty much what everyone looking to start up should do. If you believe your gut to get you to the right place, more often than not, it will. 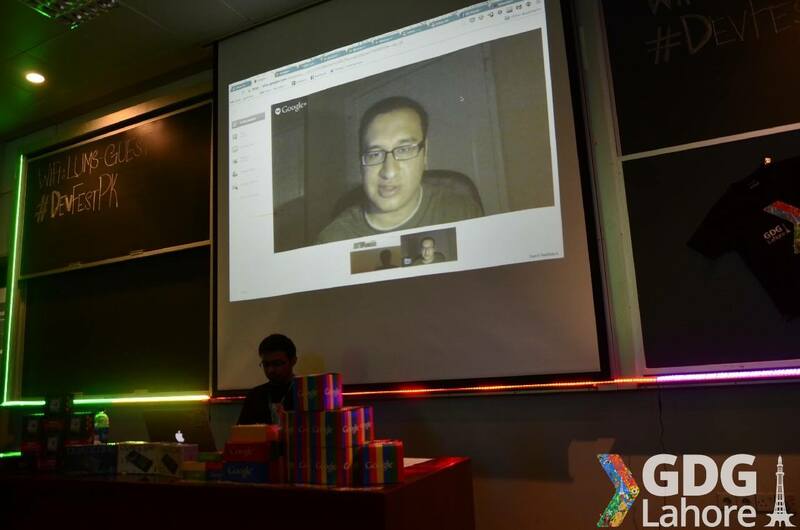 To wrap up, the man himself, Haris Nadeem, Community Manager of GDG Lahore (and the one to blame for the event) took to the stage to thank everyone for attending, participating and enjoying. Evening tea was set up in the same room as earlier in the day, and shirts were handed out to all the attendees. It had been a long and tiring day, but every minute had been well worth it. 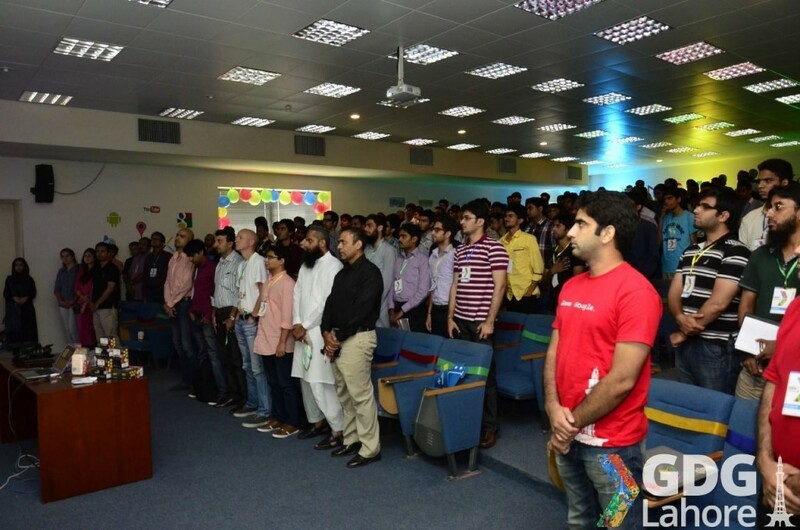 I thank Haris and his cronies at GDG Lahore and LUMS for planning and executing a terrific event, and for making the last day of my summer vacation one to remember. I still want a goodie, though. It was Jehan and Rabia Garib’s twitter feed that led me to register my product for the mBillionth Award 2010. When I registered, I knew that we’ll be rejected in even short listing as we couldn’t find an appropriate category to nominate our product. Moreover our application was unlaunched and running in private alpha amongst our own company employees. We thought that by the time jury will judge our entry, we will launch the public alpha. But if you are in a telecom business where operators have an upper hand, launching your service independently becomes a herculean task. I don’t know which place did we end up in Grand Jury held in Colombo last month but I am happy that we were at least shortlisted for jury.